← Bite Me – A Nana’s Cookies Review and Giveaway! Otherwise known as a pasta-less pasta dish…. More and more I’m going grain-free these days. I’ve found that I just feel a lot better if I stick to fruits, veggies, beans, nuts and seeds. My friend remarked, “you’re on the pre-agrarian diet.” We debated that a while, and decided it’s not entirely true. I’d need to be eating a lot more meat, and a lot more local for that to be true. But, I am eating a lot more whole foods, a lot more raw foods, a lot less processed anything. Pasta, as tasty as it can be, is essentially a pretty processed food. Yes, yes, the ingredients in pasta, even the gluten-free variety, are all things we can pronounce and things we can buy ourselves. We’re not talking processed in terms of harsh chemicals. But, we are talking processed in terms of refined grains – grains that cause blood sugar spikes, despite how healthy they may appear in their whole form. (Quinoa – I’m looking at you.) And, frankly, when I make a meal like this, and leave out the pasta, I just don’t miss it. Confession time. I did make a small side of quinoa pasta for the kid in the household. It worked – he ate all the veggies and beans and pronounced the meal a success. Whew. Heat the olive oil in skillet over medium-high heat. Add the onions and cook until softened (about 5 minutes). Add the beans. Cook until beans and onions begin to caramelize just a bit. Add the broccoli. Cook, stirring constantly, for about 2 more minutes. Add the pesto, tomato, and salt. Stir to coat. Cover the skillet and allow to rest a few minutes to let the broccoli steam. Serve garnished with additional basil if desired. This post is linked to Two For Tuesdays at A Moderate Life, and Slightly Indulgent Tuesdays from Simply Sugar and Gluten Free, and the August Pesto Challenge at the Gluten-Free Homemaker’s Gluten Free Wednesday Round-Up. 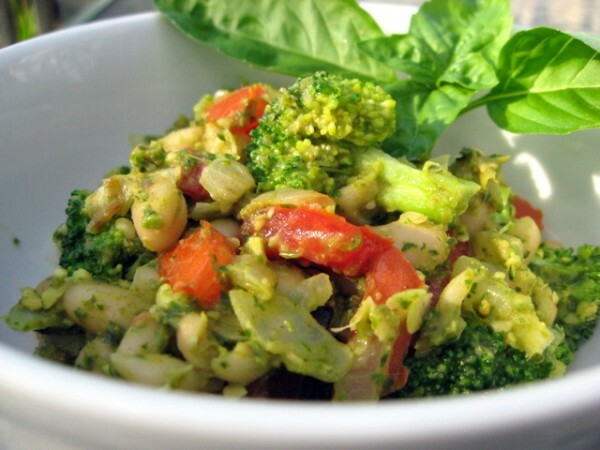 This entry was posted in arugula, basil, beans, broccoli, cashews, grain-free, main dish, tomatoes. Bookmark the permalink. Deanna – this looks absolutely delicious!!! What a unique recipe for pesto! I will have to try this! Your veggies in these pics just look so fresh and delicious!! YUmmy!! Thanks Carrie! I think the light was a little too harsh (and foodgawker agrees). But, so it goes. I have to get a photo studio set up – I’m already losing my good filtered evening light and soon it’ll be dark out when it’s time to take food photos. So sad! Ooh I love it! I also far prefer the accoutrements to the pasta. I like to eat pretty much the same way as you described without a lot of flour foods. The veggies and beans are the good part, anyway. Thanks Alex! I’m excited to have found a new blog hop, too. It’s a great way to find new blogs! I’m a celiac, and in the first few years post diagnosis, I ate my share of gf bread and pasta, but this year, I’ve found myself drifting away from grains altogether (except I recently discovered how to make quinoa), by instinct. So, I found this post very appealing. Thank you for linking up with Two for Tuesday. I want to like quinoa, but I really don’t like it that much. Ah well. I’m enjoying this journey and figuring out what real food works best for me. It’s always interesting to hear about everyone else’s journeys, too! I will take a big bowl of that goodness please. What a great link up to Two for Tuesdays! I love seeing new pesto ideas and this one looks delicious. I love the colors in your photo. I wanted to let you know that I added this pesto recipe to my favorite recipes from last week! I usually find pesto to look extremely unappetizing. Yours is on the contrary though! Thanks so much Aubree Cherie. 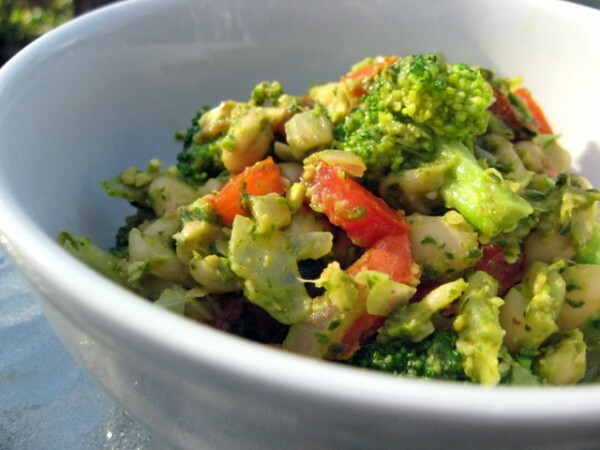 I hope you give it a try – it might make you change your mind about pesto! This looks excellent! I have such a limited range of grains that I can eat that it’s hard to not overdo any of them…. so it’s good for me to have grain-free meals…. like this one! I find that cannellini beans are so soft and smooth that they give the same kind of texture that I’m usually looking for from pasta anyway… that chewy, full-mouth feeling. Thanks for a great recipe! I’m glad you like the sounds of it, Laura! I hope you enjoy some of my other grain-free recipes as well.